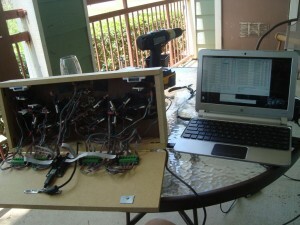 This post has been a long time coming, so bear with me as I try to recall just how I made my very first MIDI Controller. 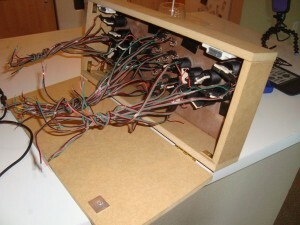 It was way back in early 2012 that I found this tasty article from 60works about building your own MIDI Controller. I took that instruction set and flexed my creative juices to produce this boxy little beast. Yeah, there were multiple trips to Home Depot, but it’s part of the learning process. And I learned alot. 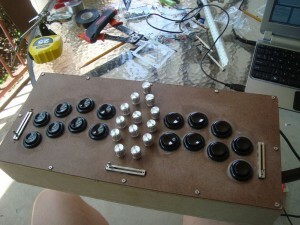 So I stumbled on this page and it gave me the tiny belief that it was possible to build my own controller. 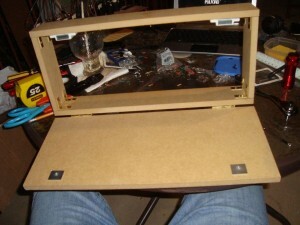 The hardest part I saw ahead of time was building the box for the device. Everything else from that article spoke to me and told me that I can build one of my own. Plus it’s super cool. Research on the interwebs helped out immensely. I was coming up with ideas on just what to do and landed on something that can ergonomically fit my hands and allow me to manipulate multiple settings to its maximum count. That meant I needed arcade button. It also meant that the faders and potentiometers had to be within reach. I drew out a couple of designs and eventually went with something that looked like a boomerang. This the Boomawang was born. As you can see, the buttons were all lined up properly with my fingers. That makes it easy for me to hit will all 8 non thumb fingers. The pots needed to be twisted so I put it in the middle where my thumbs can be put to use with my index fingers. The Hale Micro UMC32+M MIDI controller had about 3 slots left so I added some faders with the easiest access being on the bottom for my thumbs. Yeah, it fits pretty well. So how did I build it? Well the design portion ended up being an wonky GIMP image that I could move items around. This after penciling the ideas down on paper. Once I had the design down, I got my materials list going. The arcade buttons were from X-Arcade, the faders are pots I got from Hale Micro. Also, the hook up wire was a good call from the 60works. They were stuck together and easy to place and bend in strip. The hardest part again was the wood. Due to the suggestion of 60works, I headed to Home Depot to scope things out. I got my dimensions down and looked for any kind of wood that could work. I found some type of pressed wood type to build because it was thin and very sturdy. How would I cut it? Well, that let me to purchase more power tools. But only for the hole cutting. You can actually measure out lengths and have Home Depot cut the wood for you. That was a life saver. So I mentioned cutting holes. That ended up being sloppy but some wood filler fixed that fast. In fact my carpentry was more of a guideline than an exact science. 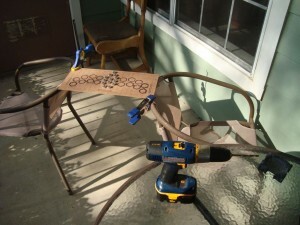 In some cases, it was fine leaving it alone, but in others I executed the wood filler furiously. With all the cutting out of the way, it was time to put stuff together. The soldering we through relatively fast once I got the hang of it. 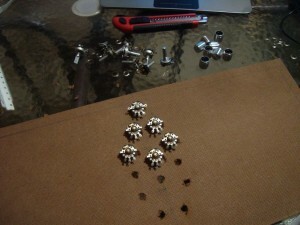 It was my first foray into soldering so it was kinda of sloppy work looking back. But I did make all of the connections and got it to work. So the most important requirement was met. The faders were kind of a challenge but I used some cheap breadboard plastic to set it in. All of the wiring kind of clumped in the box. The hook up wire and how it stays in place when placed helped but it’s still kind of a jumble of wires. I screwed down the Hale Micro UMC32+M and its breakout boards to the bottom of the box. I connected all the wires up. The pots were hard to keep from sliding so I had to scratch in a notch so it couldn’t move. But I hooked those guys up as well. One great suggestion by the guy at Home Depot was to use hinges and magnets for the bottom of the box. So now when I need to get in there and do some work, I can open it up pretty quickly and operate. The magnets are just powerful enough to keep the bottom lid on. And when I’m ready to replace the USB cable, I can pretty quickly. I didn’t want to spend the time or money on a mounted USB cable. So I just cut a hole in the back and ran an standard variety through. I hacked together an old computer case bracket to screw down the cable so it wouldn’t pop out if it got yanked. But at some point if I need to replace that with something a little more sturdy and official, I can do it. With everything put together, it was time to test. The software from the Hale Micro was kinda jankey but I was able to program each part of my box to my needs. The response time is decent. The faders are kind of sticky but I think it’s because of wood filler getting in there. The pots work well but the physical switch to turn them ‘off’ was something I needed to get used to. The arcade buttons can take some serious abuse. Why did I call it the Boomawang? Well, it’s close to boomerang, it’s kinda funny, and no one else has that name for a controller. The button layout looks like a boomerang and I ran with the idea. It works out great and the whole experience was a fun and educational one. I have some more parts waiting for another project but until then, I’ll be stroking the Boomawang.